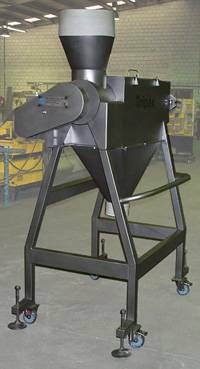 Tripax Engineering has introduced a new small sifter into its range of powder handling equipment. Constructed from stainless steel to food industry standards the small sifter has a capacity of up to 50 kg per minute. It’s simple operation and sturdy construction will offer many years of production life. Safety is always a concern and covers are interlocked. The cylindrical screen is easy to remove by unscrewing two finger screws and pulling the end plate off and pulling the screen out. Maintenance is simple and quick. It is suitable for flour, flavourings, sugar etc. and compliments the Tripax range of powder blenders.